The only time a presentation like this is appropriate is for a Halloween party. Or, maybe, when celebrating Charles Manson’s birthday. So when Shane suggested we throw a Halloween party (and, faced with the challenge of making, and finding people to eat, Bostini Cream Pies) I knew sugar had to be a key factor. The theme was dessert — all sugar, all the time. (Well, OK — there were a few savories, but they weren’t attacked with the ferocity of the dessert buffet.) Our friends brought tons of treats: Honor made gorgeous coconut pyramids, Phyllis brought warm-n-cozy apple crisp, Jenny baked up her grandmother’s apple pie recipe (the BEST apple pie I have ever tasted), Nancy whipped up chocolate decadence cupcakes (frosted orange!) Beth & James plated elegant cookies with rubber tarantulas and Lauren came bearing vanilla ice cream to accompany everything! The cake recipe comes from Sweets: Soul Food Desserts & Memories by Patty Piner. The cake is pictured on the cover, and it’s what made me buy the book. I’d been looking for an excuse to bake it, and the party gave the opportunity. Strawberry, though certainly not an unusual flavor, is not one normally found in cake which, I think, is part of this cake’s appeal. It’s hard to miss — and not love — it’s vivid pink color. The cake is pretty sweet, but not cloyingly so (unless you eat a huge piece without a cold glass of milk), and has with the lovely fruity and perfumey flavor and scent of strawberries. It’s fresh and delicious. The crumb is tender, yet sturdy enough to stand up to the stiff frosting (though I probably should have added more juice to thin it a bit and make it easier to spread). Don’t be put off by some of the ingredients. 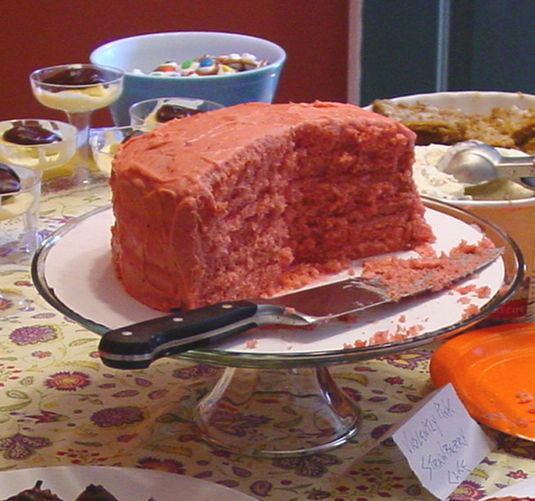 Even though the recipe employs cake mix AND Jell-O, the cake doesn’t taste like pre-fab factory food. It just tastes very, very good. Preheat the oven to 350-degrees F. Lightly grease and flour three 8-inch cake pans; set aside. For the cake, combine cake mix, Jell-O, flour, and sugar, mixing well. Add oil. Add the eggs one at a time, beating well after each addition. Add water and strawberries; mix well (the strawberries will break up nicely). Divide the batter evenly between the pans and bake 25 – 30 minutes until a toothpick inserted in the center comes out clean. Cool the layers in their pans on a wire rack for 10 minutes, then unmold each layer onto the racks to cool completely. To make the frosting, combine the strawberries, sugar, and butter and beat until smooth and well blended. 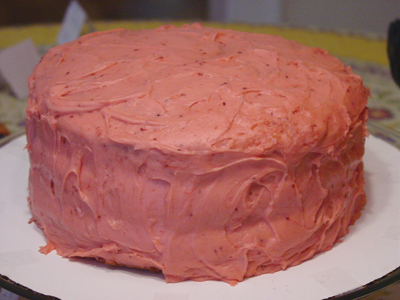 If needed, add the reserved juice, one tablespoon at a time, until a frosting-like consistency is achieved. If desired, add food coloring, one drop at a time, and blend until the color is uniform. Transfer the cake layers onto a serving platter one at a time, trimming to level if necessary. Frost between each layer, on top of the cake, and around the cake’s sides.